Chinazam is a senior at Eleanor Roosevelt high school. She is currently in the Science and Technology program and, finds joy in writing. Uhegwu is a poet and enjoys entertaining individuals through spoken word poetry. Uhegwu is also a chem whiz at heart. She has devoted her time into studying social issues and learning how to go about them. 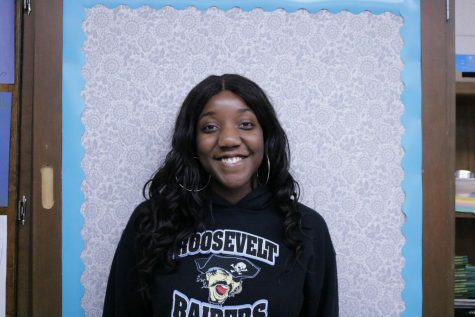 Wanting to bring more awareness to not only politics on peers but the art of expression, Uhegwu decided to join journalism in her senior year. Journalism has always held weight in societal knowledge beyond Eleanor Roosevelt. Uhegwu knew that joining journalism would build not only her way of formally addressing issues, but would build her character in face of those issues as well. Chinazam did not forget about the other valuable parts of journalism. Chinazam plans to be right in the sidelines capturing all the gracious athletes of Eleanor Roosevelt. Uhegwu has other interests besides journalism. These interests includes expression through the poetry club, social awareness in black student union, decoration, tutoring and working her long hours at the diner.